Heritage scorecard: GOP lawmakers complain about the foundation's ultra-conservative standards. 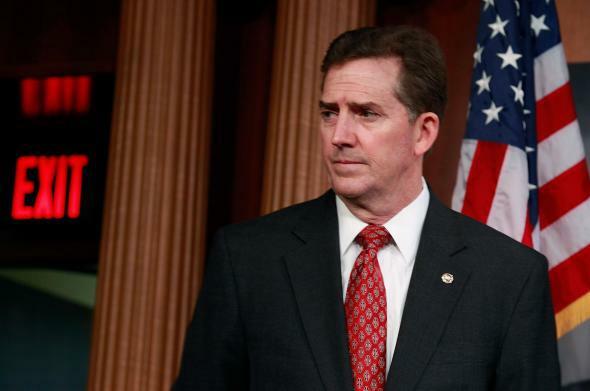 GOP lawmakers want Heritage Foundation President Jim DeMint to cut them a little slack. The conservative Heritage Foundation is about to host a retreat for congressional Republicans at a spa in Virginia, but their relaxing escape from Washington could wind up being a little awkward. A recent meeting of the House’s Republican Study Committee brought a confrontation with the former senator who heads up Heritage over the foundation’s insistence on strict fidelity to its far-right values. The Heritage Foundation’s political arm, Heritage Action, scores lawmakers’ votes to determine their alignment with the organization’s priorities—like reducing welfare spending, fighting financial and environmental regulation, and restricting access to abortion—using rigid standards that can trip up even their most loyal allies. According to Politico, members of the RSC complained on Tuesday to Heritage President Jim DeMint that the scorecard could be hobbling Republicans’ success by unfairly tarring legislators as too liberal. Georgia Rep. Austin Scott questioned how the conservative Heritage Action scores legislation. Heritage Action actually scores Ryan as voting with the group 58 percent of the time. The Republican Study Committee has recently come under fire from an ultraconservative faction of Republicans for deviating from its 40-year mission of keeping the GOP from moving toward the center, and news of RSC complaints to DeMint over Heritage standards could intensify that criticism.